When I head out into the woods, the items on my key chain go from handy to downright essential. So essential, that keeping them on a key chain in my pants pocket is just not the ideal solution. The key chain side of things is annoying because it's tedious to get items on and off. And the pants part of the equation isn't ideal either: what if I'm wearing shorts without pockets, or my backpack such that I can't easily access my pockets? And then there's the whole question of what do when it's time to sleep. I can shove the key chain in a tent pocket, but that puts some serious distance between me and these critical items (like the flashlight that might be handy for finding said tent pocket). It's tempting to wear the items on a necklace of sorts. But I think dangling things around your neck without a proper quick-release is just asking for trouble. And besides, wearing a necklace doesn't solve the sleeping problem. 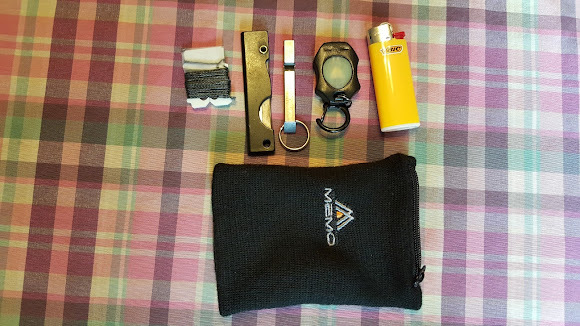 The above is a MEMO Athletics Zipper Sweatband Wristband, which I stuffed with my absolute essentials: 20ft of 100lb test braided line, Derma-Safe knife, Nitecore Titanium Whistle, Photon X-Light and Bic Mini Lighter. 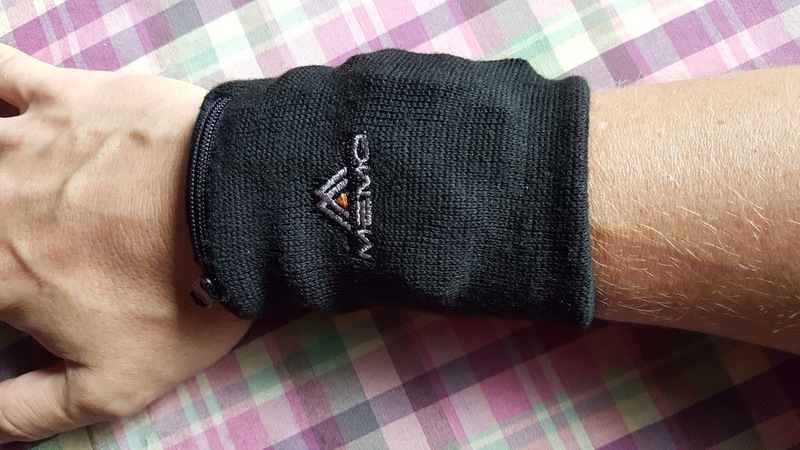 These items easily fit in the sweatband, with plenty of room to spare. And to my surprise, they had almost no movement once I put the wristband on. It didn't take long for me to forget that I was even wearing the wristband, and as long as I had my right arm, I had my essentials with me. Best of all, I was able to sleep in with the MEMO on without a second thought. It just worked. Of course, the solution isn't perfect. The items bulge, so this isn't a way to carry in stealth mode. And there's no organization to the items; I found that to get to one item I had to take off the wristband and fish out what I was after. But this was still far less tedious than taking out my key chain and disassembling it. Finally, the sweatband is warm. On our last trip, this was a good thing as it was quite chilly out. On a really hot day, I'm not sure if this solution would become unbearable after a time. It's worth noting that you can wear the MEMO around your ankle, which may solve some of the above issues. All I know is that I had my essential gear with me at all times, and I was totally rocking a rad look.